It is the anniversary of my blog. I started it in January 2012. I am somewhat surprised I have managed to keep it up and that I haven't run out of tips yet. This week I am making the entry on a Sunday. I generally post on Friday but on Friday I was driving to the airport in Cincinnati. Yesterday I put away all of the Christmas decorations and took down the garland from my porch as the temperature was 60 degrees. It is supposed to start getting cold tomorrow. I won't be doing an entry next week as I will be in Phoenix for TNNA. I did get some lessons to review over the holiday. There seemed to be some problems with the mail service. One lesson was lost and another took almost 2 weeks to arrive. I strongly suggest that you photograph your swatches, front and back, so that if there is a delay or the package gets lost, you can look at your swatches when you read my letter. 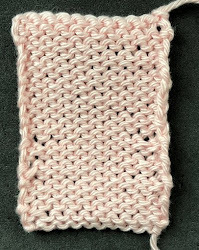 After you put the stitches for the thumb on waste yarn, most mitten patterns have you cast on one or two stitches over the thumb location. It seems most recommend the backwards E cast on which is very loose. This can contribute to the sloppiness of the thumb join. That excess yarn always seems to work back into the stitches on either side. I generally don't cast on any stitches or maybe just one. When it comes time to pick up stitches for the thumb, I just use the slack yarn (and there always seems to be plenty) to create the stitches. I twist the yarn the way you would for M1L or M1R increases. When you pick up those stitches leave a VERY LONG tail. You will need it to neaten up the thumb. The thing to keep in mind is that this process is more like embroidery. It isn't knitting. With each stitch, look at the RS to see how the process is going. This is a time to remember that this is not machine knitting. Each thumb will be different. The main goal is to close up the holes and not have it so bulky that it is uncomfortable. If you can make your weaving in look like stitches, so much the better. Salon will be today from 2-5 pm. I won't have Salon next week as I will be in Phoenix. I finished up all of my holiday knitting in plenty of time and managed to get the packages off well before Christmas which is unusual for me. We had our selection meeting at the beginning of December and I have had difficulty receiving the yarn for my designs which has been rather nerve wracking. I finished up these socks. Luckily I had purchased the yarn at our conference in Manchester. I am still expecting the yarn from Hundred Ravens but the dyer broke her ankle in December! I'm calling these Rick Rack Socks. They were fun to knit. I did receive the yarn from Mrs. Crosby in mid December. The stitch pattern for the Summer issue is rib stitch patterns and I wanted to do a sweater where ribbing is used to shape the sweater (fitted sweaters are the topic of the Spring issue). Mrs. Crosby yarn is perfect. It is very springy. You have to be very careful when blocking ribbing not to overblock it. For this sweater, if you want it to be fitted, just smoosh the ribbing in place during blocking. If you want the ribbing to be more of an embossed design, pin it and stretch it out. I am waiting for the zipper I have ordered from Zipperstop.com to finish up the sweater. It will have a turtle neck. By the way, the color in this photograph is all wrong. It is more of a golden color. One of my daughters selected this yarn, Freia, for a small shawl. I managed to finish it while waiting for yarn to arrive. I did get the yarn for a skirt I am doing for the Summer issue but I haven't started it yet. Thank you, Arenda, so helpful!